Brazil’s modernist architecture may be better known, but the country's distinctive midcentury modern furniture is getting new international attention. Sensuous curves, tropical woods, woven leathers and traditional techniques like caning and netting were all part of a style that developed from the 1940s to the 1970s called Brazil Modern. “When it all comes together, it’s like the music of Gilberto Gil,” said Juliet Kinchin, curator of modern design in the department of architecture and design at the Museum of Modern Art in New York, which recently acquired four chairs by Brazilian furniture designer Lina Bo Bardi. Piece by piece, midcentury modern works from Latin America are gaining visibility in museums and galleries across the United States. “Brazil is one of the last -- if not the last -- great discoveries of 20th century design,” says collector Zesty Meyers, who wrote the introduction to “Brazil Modern” (Monacelli Press), a mammoth new survey by design curator and writer Aric Chen. Brazilian author and design professor Maria Cecilia Loschiavo dos Santa interviewed many of the stars of Brazilian furniture design in person, wrote a book on furniture of the era, and cocurated “Moderno: Design for Living in Brazil, Mexico and Venezuela, 1940-1978,” an exhibit at the Americas Society in New York last year. “Interest (in the style) has been building for 10 years or so in the U.S., but now people are really talking about it,” she said, interviewed by phone at her home in Brazil. A recent turning point, she said, was the convergence of last year's “Moderno” show with an exhibit on Latin American urban design at the Museum of Modern Art. Packed with over 400 photos and sketches, the book “Brazil Modern” brings the era to life with a detailed history of Brazil during the postwar decades of breakneck economic growth. It introduces titans of Brazilian design like Italian immigrant Bo Bardi (one of the few women designers of the era), Oscar Niemeyer, Joaquim Tenreiro and Sergio Rodriguez. The same immigrant wave that brought post-Bauhaus designers and architects to the United States, ushering in elements like floor-to-ceiling windows, family rooms and open-flow houses, likewise brought post-Bauhaus architects and designers to Brazil. In Brazil, this generation of designers became part of a national melting pot just as the country was emerging from colonialism and developing a national spirit known as “brasilidade,” or Brazilianness, Meyers said. The Brazilian design quest was for “authentic modernism,” combining lustrous indigenous materials and traditional local craftsmanship with European references and Bauhaus geometries to form an aesthetic all its own. The idea got a boost from two early visits by the Swiss-French midcentury modern architect Le Corbusier. And a groundbreaking 1940 MoMA exhibit on “Organic Design in Home Furnishings” featured a Latin American section. But because the pieces were not made in large numbers and were generally made to order for private homes, not corporate settings, they weren’t readily available or visible outside Brazil. Today, they seem to have gained new relevance. “One of the qualities of Brazilian design that really appeals to the contemporary audience is its embrace of the modern, while remaining deeply rooted in a profound relationship with natural landscapes, resources and the traditions of Brazil,” Kinchin said. An eye-popping 1947 chair by Joaquim Tenreiro is crafted from four very different types of Brazilian hardwood, and features a bonded laminated frame and three elegantly tapered wooden legs. “Tenreiro's work has a real lightness and feel to it. The wood itself becomes part of the decoration of the furniture,” said Sarah Coffin, curator and head of product design and decorative arts at the Cooper-Hewitt, Smithsonian Design Museum in New York. That museum acquired a chair and stool by Tenreiro in 2004, soon after midcentury modern furniture from Brazil started to appear on the market. Lina Bo Bardi, also featured in the book, is most famous perhaps for her 1951 Bowl Chair. 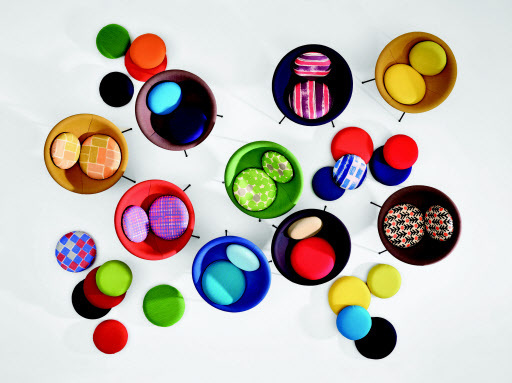 Featured on the 1951 cover of Interiors magazine in the U.S., it was an upholstered half-sphere nesting in a circular metal frame with four legs, and came in a rainbow of colors. Bo Bardi and her husband, architect and designer Pietro Maria Bardi, arrived in Rio in 1946 from Italy, where she had worked with designer Gio Ponti.